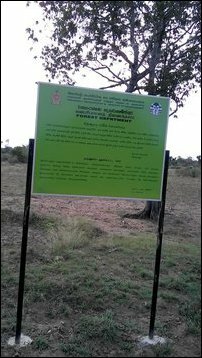 Genocidal Colombo's Mahaweli Development and Environment Ministry, which comes under the SL President Maithiripala Sirisena, has instructed the SL Divisional Forest Officer in Batticaloa to put up noticeboards annexing more lands to extend the Omunugala ‘Forest Reserve’ in Batticaloa district. Sirisena’s ministry is trying to attach more than 25,000 acres of pasturelands seized by the previous regime of Mahinda Rajapaksa through SL Minister of Environment and Renewable Energey, to the so-called forest reserve. The occupying Sinhala military is blocking Eezham Tamils and their livestock from entering the pastureland. New boards have been put up with warnings and borders have been marked. However, Sinhala colonizers are being encouraged by the occupying SL military to do seasonal cultivation in the pasturelands that are being seized from Tamils under the name of ‘forest preservation’. While co-sponsoring the resolution on ‘Sri Lanka’ at the Human Rights Council Geneva with the USA and getting it passed unanimously without a vote with the false promises that lands would be handed back to the original owners and that the military would be kept away from civilian affairs, the officers of the occupying Sinhala military in former LTTE-administered Tharavai in Koa'ra'laip-pattu of Paduvaankarai in Batticaloa district summoned the Eezham Tamil villagers last week to instruct them to keep away their cattle from entering the pasturelands. According to a blueprint, co-produced by Colombo's Mahaweli authority and a New York-based firm in 1980, more than 53,665 hectares of forest lands, declared as ‘Omunugama Forest Reserve’ were to be brought under the accelerated Mahaweli scheme. At the end of July in 2013, Mr Susil Premajayantha, the then minister of environment under former SL President Mahinda Rajapaksa, declared more than 25,000 acres of pasturelands from Koara'laip-pattu North (Vaakarai), Koara'laip-pattu (Vaazhaich-cheanai), Koara'laip-pattu South (Kiraan) and Ea'raavoor-pattu (Chengkaladi) as being included in the forest reserve. The Tamil farmers had been using these lands as pasturelands for their cattle for more than 50 years. The Sinhala military and its so-called ‘Homeguards’ paramilitary launched a war of aggression against the Tamil farmers in Paduvaankarai. The occupation has entered a new phase following the recently put up noticeboards and the instructions coming from the SL military, the Tamil farmers in Paduvaankarai said. The repeated complaints from Eezham Tamil farmers against the Sinhala colonizers have been systematically ignored by Colombo. The SL Government Agent of Batticaloa district, who uses to chair the inauguration of the main seasonal (Maanaavari) cultivation, was avoiding to attend the meeting fearing questions from the farmers. 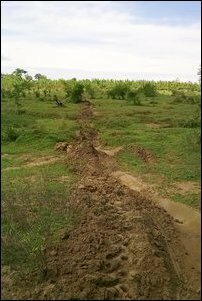 In the meantime, hundreds of Sinhala colonizers are ploughing the pasturelands for seasonal agriculture within the demarcated ‘forest lands’ seized by Sirisena's ministry. The SL military at Tharavai has warned Eezham Tamils not to allow their cattle to enter these lands, the Tamils farmers said.